Although there are not a great variety of birds within the city limits of Quito Ecuador, there are some species that are quite impressive. The Black-tailed Trainbearer (please see additional article for technical information) is a hummingbird that can be encountered within the confines of the city and will leave an everlasting impression on the observer. Its long flowing tail and energetic antics are a sight to see in the bustling environment of the downtown confines. When I first arrived in Ecuador one of my earliest memories was seeing this magnificent creature visiting the flowers around the house where I lived. I later moved to a larger home where there was much more area for this visiting neighbor. 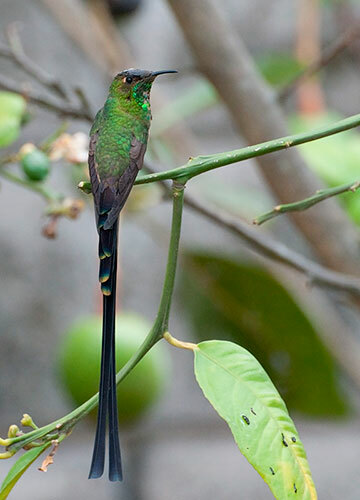 The fruit trees in the back yard were a favorite habit for the Black-tailed Trainbearer as well as the Sparkling Violetear, a larger interloper that often resulted in quarrelsome exchanges concerning territorial disputes. When I retired I moved to a much smaller house and I was afraid that my encounters with this lovely hummer would end. My patio area is less than the size of a normal bedroom and there are few flowers other than the tiny patch outside my front door. However, I was wonderfully surprised to see my diminutive friend resting in the ficus that I had placed outside my living room window. I have since then installed a feeder in this tree so that I can view his visits while I write my articles. A couple of months ago I was writing an article when I heard a very familiar sound directly above my head. A female Trainbearer had entered the door that I had left open for my dog Boo. She was trying furiously to escape her confines but only succeeded in beating her head repeatedly against the ceiling. I became very concerned about the health of the little creature, as I know that the metabolism of the hummingbird is such that they can become exhausted quite easily. After several frantic moments I was able to extricate her from the captivity within the house. I later notice marks on the ceiling left by tiny feathers that had been shed from the hummer’s head. The Black-tailed Trainbearer can be very aggressive and quite territorial. I have seen them attack much larger birds in an effort to protect their treasure trove of nectar. I myself have had close encounters with them while photographing them for my writing. They can be approached rather closely, if one is cautious, and will sit quite still while you observe and record their behavior. Last summer, while taking an early morning walk down the empty streets of Quito, I was shocked to stumble across a mating pair of birds in the middle of the sidewalk of one of the normally busiest avenues of the shopping district. The male, with his elongated tail feathers separated to form a giant “V” for victory, ignored my advance and went about his routine. Unfortunately I did not have a camera to record this unique display of disconcerting behavior. In a country that is home to over 130 different species of hummingbirds it is difficult to say exactly which one is your favorite. However, I would have to place the Black-tailed Trainbearer somewhere within the top ten for its distinctive features and outgoing personality. Whenever you have an opportunity to visit this exciting birding paradise do not pass up the occasion to spend some time observing this phenomenal bird. I had a friend that had hummingbird feeders on his back porch. We were talking he then put some sugar water in his belly button. The hummingbirds came down and got there share of the sugar water. 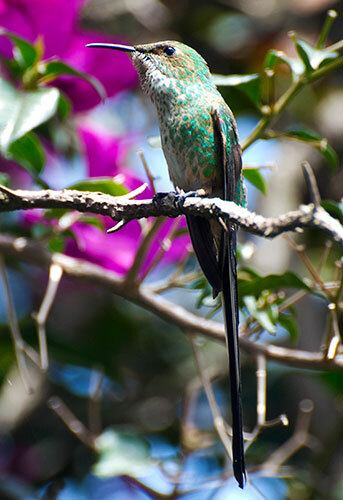 That was the first time I ever seen a hummingbird. Hummingbirds fly so quick you can't hardly see them. We use to have hummingbirds here but its getting so built up you don't see them anymore. I didn't know you could actually get a photo of these fast allusive birds. Great Blog!